The majesty of the moa has been long forgotten. Ask anyone “do you know about the kiwi bird?” and they will most likely say “Of course! Who doesn’t?” But ask anyone “Do you know about the moa?” and they will say “Is that a type of dolphin?” or something equally ridiculous. The moa was, in fact a large, flightless bird (actually, they were not only flightless but wingless too, lacking even vestigial wings.) In appearance, it is similar-looking to a kiwi, but on a much larger scale, even though their closest relative was not a kiwi, but a South American tinamous. Of the nine species of moa, the largest was much bigger than an ostrich, at about twelve feet tall.The smallest was about three feet tall, but it is difficult to determine the exact size as the females were much bigger than the males. There were three main groups of moas, the largest being the Dinornis group, which had long legs, but with a heavier build than, say, an ostrich. It is most likely that they developed long legs not for running, as they would not have much need to, but instead to reach the trees. They also developed their long neck for this, because if they could reach the trees, there would be much less competition between the smaller and larger moas for the plant food. The second group of middle-sized moas had an extremely heavy build, with short, stumpy legs which suggests they would be really quite clumsy. However, it is widely considered today that this group could move well, but the bones of one particular species does suggest it had a bit of a waddle. This group ate the flora which grew on a lower level then that of the Dinornis group. Finally, the smallest group had a much lighter build than the middle group, while a whole lot smaller than the larger group. It had long, slender legs, which proves it could move faster than the other groups, and it ate the grass and low-level vegetation. They became extinct at around 1300 A.D, primarily due to overhunting by the Māori, the indigenous people of New Zealand that arrived from Polynesia. Other reasons were the dogs and rats these people brought with them, and the fires they lit to root the moas out of the forest, which resulted both in habitat destruction and direct death by the flames. In fact, the moa only survived for a hundred and fifty years after the Māori arrived! Before the Māori,, the only enemy of the moa was the huge Haast’s eagle, which was one of the birds that took to the ground while still retaining the power of flight, unlike the moa and kiwi. 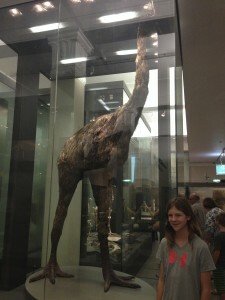 Remains of moas found in New Zealand have shown that these huge birds swallowed stones to help break down their food, like other birds (including ostriches) and even some dinosaurs. These stones are known as gizzard stones, and swallowing them meant that the moa was able to eat particularly coarse plant material. A moa could hold several kilograms of these stones! 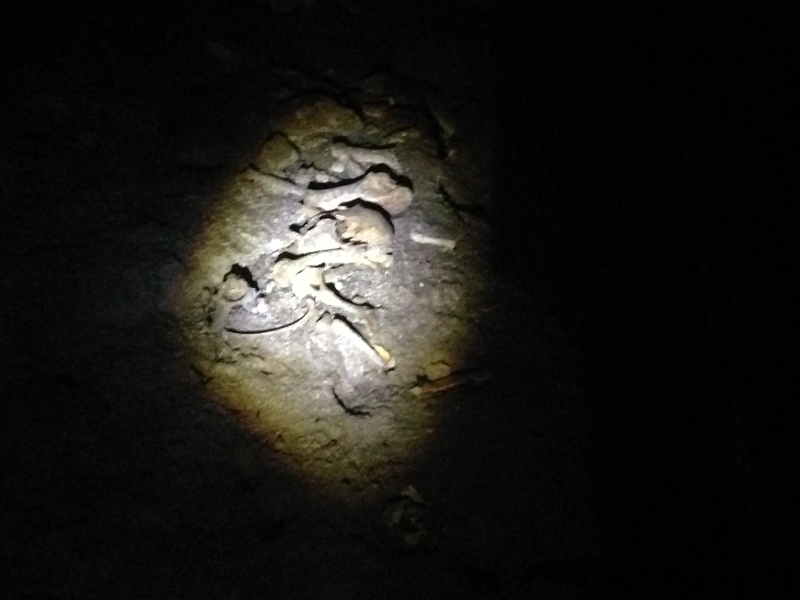 While on a cave tour, our guide pointed out to us some moa bones which had been found there. The poor beast had been wandering around, looking for a good tree to chew on, when it fell into a sinkhole and was promptly killed by the fall. It probably lay there for a couple of years, then the nearby volcano erupted, covering it up and fossilizing the bones. It was found completely by accident while people were excavating the caves. The spinal cord, one of the feet and a bit of the other, and the head were still intac t. Several gizzard stones were also found. They put the complete foot back together, and arranged the rest of the skeleton as best they could without the other bones to go by, where it still lies waiting for the snapping cameras of us tourists. 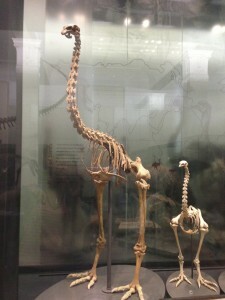 We also saw several skeletons in a museum, where they were dramatically arranged to give the moa all its height. However, studies have shown that it walked more horizontally, with its neck bent forward.